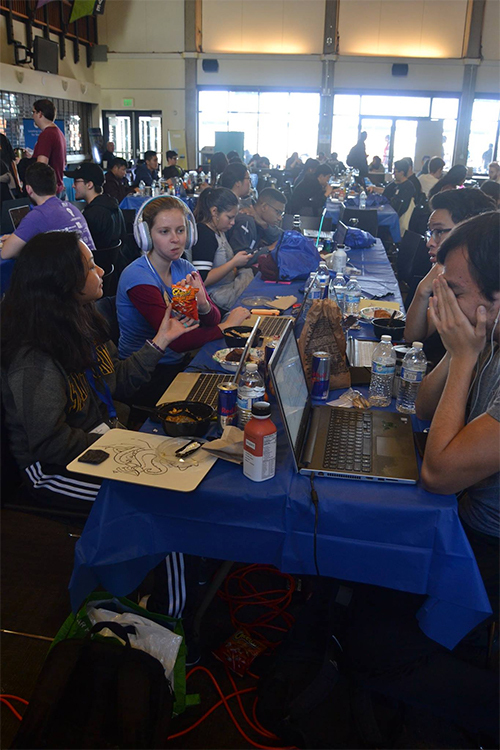 More than 500 people spent a January weekend in the Porter Dining Hall coding new applications for CruzHacks 2018. Photo: Rilee Hillman. In its second year as a fully student-driven event, CruzHacks 2018 provided an environment that encouraged collaboration and networking. The 36-hour coding marathon is also an opportunity for Silicon Valley companies to meet the next generation of innovators. Sponsors including Google's virtual reality product, Daydream, and UC Santa Cruz's Genomics Institute challenged the 88 teams to produce apps employing a range of technologies. Kerrie Lu, a City College of San Francisco student, and her team, Epsilon, created an app that can identify redundant data to address the growing burden of data processing. "I expect an opportunity to test my coding skills, meet some new people, and hack a new app," she said. Lu's team's app was recognized by sponsor Big Data Federation. Amlaan Bhoi, a masters student from the University of Illinois, Chicago, came with a team that created a soothing virtual reality environment for anxiety sufferers. For Bhoi's team, the hackathon was also an excuse to visit Santa Cruz. "That inspired us to attend and make something great," he said. Co-executive directors Anjali Kanthilal (Crown '18, technology and information management) and Zimraan Hamid (Cowell '18, technology and information management) touted the event as a rich opportunity for networking and collaboration. Past attendees have made connections that developed into internships and jobs.